BUNIA, 2 Nov 2006 (IRIN) - Close to 15,000 voters in Fataki, an area in northeastern Democratic Republic of Congo, began voting on Thursday in presidential elections after a four-day delay caused by riots in the area. The riots followed the killing of two polling clerks in the town, 90 km northeast of Bunia, on Sunday. The nation's Independent Electoral Commission announced the delayed elections in response to a request by the Member of Parliament for Fataki. During the riots, angry relatives of the clerks and other residents burnt down 43 polling stations in the area. They also attacked the police. A further eight polling officials were hurt in the melee. Residents were angered when Sgt Innocent Mamale shot dead the two electoral clerks while most of the nation voted in the presidential polls. 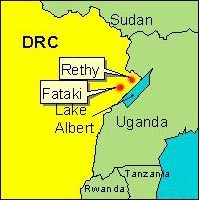 The dead were residents of Fataki. Mamale has since been sentenced to death for the killings. Fataki is a small administrative area in the troubled district of Ituri, Orientale Province. Initially, voting in Fataki was rescheduled for Wednesday, but was pushed back a day to allow for the replacement of burnt voting material. "MONUC helped us deploy ballot boxes; the public was already prepared to vote again today," John Ukunya, the head of the electoral commission bureau in Bunia, said on Thursday. MONUC is the UN Mission in the DRC. The police are supposed to ensure security around the polling stations, but in Fataki, their numbers are low. "Security personnel will be a mixture of the army and police; all measures have been taken and it is the police who will be nearest the polling stations," Charles Boyeka, the army spokesman in Ituri, said. "We have not been there to make war or kill civilians, but to protect them. The law has been enforced, [Mamale has been condemned to death] so that other soldiers will think twice before trying to behave like that again," Maj Jose Kanku, the army commander in Fataki said on local radio, in a broadcast aimed at calming the local population's fears over their safety. He said the army had paid for the funeral costs of the dead polling agents. Ituri is one of Congo's most unstable regions. Since 1999, there has been intercommunal fighting that has already led to the death of 60,000 people and the displacement of several hundreds of thousands, according to NGOs working in the area. To secure the elections in the district, the government deployed its army 6th Brigade and MONUC has some 4,700 men and a police rapid intervention battalion. Elsewhere, polls were also repeated on Tuesday in Bumba, in the northwestern province of Equateur, after people who accused polling officials of being supporters of President Joseph Kabila destroyed 12 voting stations, Electoral Commission Chairman Apollinaire Malumalu, said. He said on Tuesday, in Kinshasa, that at least 20,000 voters failed to participate in the Bumba polls following the incident. The run-off presidential elections between Kabila and Jean-Pierre Bemba took place on Sunday. In the first round poll in July, Kabila failed to get the 50 percent and one vote needed to avoid a run-off. According to observers, voter participation was lower in the second round than in the first when about 18 million voters - just over 70 percent of the electorate - took part. "It will range between 30 and 50 percent," Rigobert Minani, the chairman of the National Network of Observers, said. At least 25 million voters were registered for the elections that mark the first democratic vote since the country's independence in 1960. Sunday's poll represents the end of the transitional government installed in 2003 following the signing of a power-sharing agreement, the Global and All-Inclusive Agreement, between the government and rebel factions.